On Day 3 of the Get your Jelly On challenge, when I made the 5 ingredient fish balls in Chinese masterstock jelly, I mentioned how versatile the fish mince was and how I often used it to make fishburger patties. This post is for those of you who prefer a more visual and hands on approach to transforming the mince into yummy patties – you will never want to go back to store bought fish fingers again! 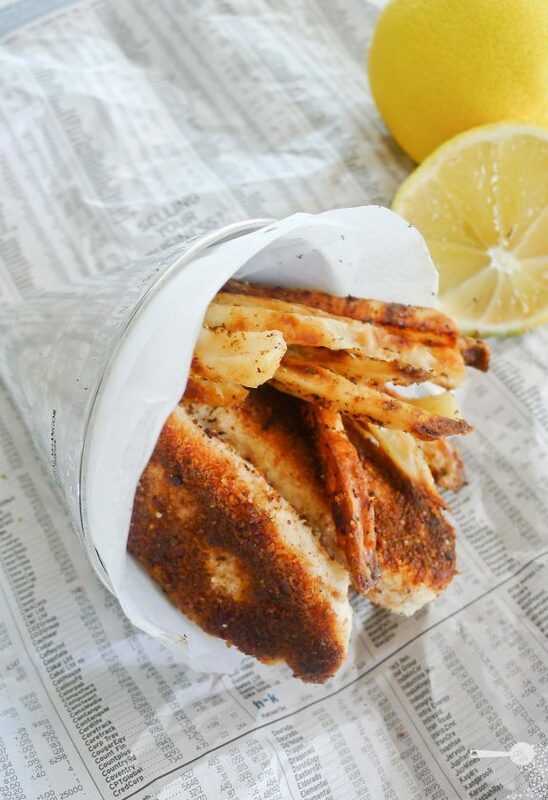 And there is no better side to complement the dish than a handful of crunchy, oven baked fries! Comment on any of the Royal Selangor Get Your Jelly On challenge posts on my blog to win an Olympus VG-110 camera – multiple entries allowed. Giveaway is open worldwide! Entries close October 30, midnight AEST. Winner will be announced on the blog on October 31. These fish fingers are great tasting and quick to make. They keep well and can be frozen or refrigerated for up to 2 days. Go well in sandwhiches, burgers, salads or even fish tacos! To prepare the chips: wash potatoes and cut into thin (about 1cm sized) chips. Place in a bowl of water and allow to soak for 5 minutes to remove the starch. Rinse under cold water then place back in the bowl with a little waater, cover with gladwrap and microwave for 2 minutes on high (or par-boil them in a saucepan for 8 minutes). Strain spread over paper towels and pat dry with more towels. Place chips back in the bowl, add the oil, salt and spices and toss to cover well. Sprinkle with the cornflour and toss again. Spread chips on a baking paper-lined tray and into the oven for about 25 minutes, or until golden and crisp. Turn them over about 15 minutes to get the colouring even. In the meantime, prepare the fish fingers. To prepare the fish fingers: dice onion finely and cook in a pan, until translucent. Allow to cool. Soak bread in the milk. In the meantime, cut fish into small chunks and place along with the milk-soaked bread in a food processor (I used my Braun’s multistick blender’s chopping attachment) and process until smooth. Add cooked onion and pepper. Using plastic gloves, form fish fingers and dip into the breadcrumbs, flattening the logs slightly. Repeat with the remaining mince. Shallow fry fish fingers on medium heat in a little oil for about 3 minutes on each side. Repeat with the rest. To serve: place fish and chips in the cone, lined with a little baking paper. Great with fresh lemon juice or tartare sauce. I recommend using coley! Very cheap and very tasty. These look awesome by the way, really delicious. For a moment there I thought I was going to see conical fish fingers! Yum! They look delicious! So fresh and healthy! very very very clever!! and it looks great!! Oh man, my shares in CredCorp are really tanking. Kidding! I like this idea and I love fish and chips. I like that you use the moulds in a practical way – for the cocktail and now as servingware. And the fish mince idea is great. Fish tacos!!! Mmmm A beautiful mould should be cherished and displayed! Well done, very creative! Love fish and chips. Brilliant idea and yes, the pewter mould is definitely you can take out and show everyone. The fish fingers and chips look awesome in the cone. It really adds a little something, doesn’t it? Definitely! A little style to an otherwise normal looking but tasty dish! Just discovered your blog – simply stunning and really like your recipes! So creative and all for a good cause. Great use of the mould Martyna! Given a choice, we also prefer baked over deep fried and we have to try the combination of curry powder and paprika with our baked chips the next time. I think perch, flathead, monk fish and hapuka are the best for these baked recipes. Beautiful presentation, love that newpaper background! Thanks guys 🙂 newspaper is such a traditional wrapping for f&c so had to use it… Good suggestions on the fish, thank you! What a wonderful rendition of fish and chips. These look healthy, light and delicious! No reason to stop making jelly-shaped dishes just because October is over! I bet we all have more than 30 ideas by now. Haha! Good point! I’ll be using it again for sure! A creative way to use the mold! Ohhh you can use the mold like this! It was unexpected and I love the unique method! Perfect cone for fish and chips! Looks delicious! Thank you Nami! I think creative is creative and I just don’t know why you wouldn’t want to showcase this gorgeous piece! Dory would be great too, thanks for suggesting! oh, as servingware! good call! It’s a beautiful piece, why hide it? Wow… ! Twoja ryba i frytki wygladaja bardzo apetycznie !!! wlasnie zabieram sie do gotowania . How did you have this incredible idea to use this cone instead of the paper cone? So obvious when one looks at your photos, but no one has thought about it I’m sure… I think this is the first “cone” recipe I might prepare! Your fish fingers sound easy and delicious (even though I have never been a fan of frozen fish fingers). I know someone who will be thrilled to see them on his plate 😉 Thank you for such a wonderful recipe! Thanks Sissi! Fish and chip cone was one of the first non-jelly ideas that came to mind! And I’m glad you have someone who might love them! The Mr Chipconnoisseur and his kids loved them! So happy. Simple recipe and funky presentation that really let’s the mould shine! I like it! Great healthy alternative for an all time fave classic. Yum. I am going to try this one out this weekend. Thanks for the healthy fish fingers, definitely fits into my diet plan. Much classier than fish and chips in a paper cone! nothing beats the crunchy bits on chips! This looks great, a wonderful alternative to less healthy fish sticks. This would be a great recipe for kids as well! Making this tonight. I HAVE TO! I love the idea of fish fingers, but I must admit I am not really in to the taste of the store bought ones. I imagine using the hamburger bun would of made the crumbs slightly sweeter than just normal bread crumbs? Oh, and great use of the Selangor mould! Love the curry powder on the potatoes. I like to think that curry powder makes just about EVERYTHING that much better! This whole recipe sounds so DELISH! Fish and chips is my family’s recipe. I will recommend this healthier version to my mom.